Select one of many predefined profiles and push a button to export your recordings to popular formats, favorite multimedia devices, Facebook or YouTube. Save energy and time using optimized and hardware accelerated video exporting with NVIDIA CUDA or Intel Quick Sync Video technologies. Record HD videos in MP4 format with Intel Quick Sync Video! Action! introduces real-time FullHD 60p video recording directly to MP4 (H.264/AVC) format with low CPU usage! Record your desktop or gameplay directly to MP4 format and enjoy smooth videos and super small file size! With Action! you can add up to 2 webcam streams to all your real-time gameplay and desktop recordings! Share more than only your facial expressions! With Action! webcam recording is easy, just select your webcam, set webcam video position and size and start recording! Action! Remote Control for mobile devices with Android! Action! 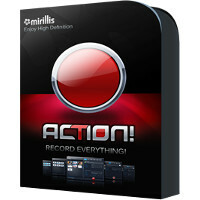 Remote Control application allows to monitor and control your Action! gameplay and screen recordings with Android mobile devices! Action! brings the ultimate experience for PRO gamers with Logitech G13/G15 or G19 multimedia keyboards. With Action! and Logitech keyboard LCD panel you can monitor games or screen recording FPS, average FPS, recording time, free disk space and more. All displayed with clean and stylish interface. Action! includes an internal ultra responsive player optimized for raw high-bitrate AVI video recordings playback. Double click video recording thumbnail on the Action! list to start playback! Enjoy the ultimate performance and stylish user interface. Select one of many predefined profiles and push a button to export your clips easily and fast to popular formats, your favorite multimedia devices, Facebook or YouTube . Save energy and time choosing optimized and hardware accelerated video exporting with Splash PRO EX. Splash PRO EX advanced exporting view allows you to convert multiple HD clips simply and fast. You can also create HD video compilations from multiple source clips from which you can remove unwanted parts. (*) This feature will be available soon in free Splash PRO EX update. Take advantage of the latest hardware acceleration technologies to save your time and reduce power consumption. Splash PRO EX combines all the latest technologies including NVIDIA CUDA and Intel Quick Sync Video with hardware accelerated video decoding to boost exporting process even more! Supports AVCHD format. Rediscover High Definition quality with Splash PRO EX and state-of-the-art Picture² technology! Watch your 20/24/25/30p clips smooth like never before with Motion² technology. Browse your clips directly from the AVCHD camcorder with HD Camcorder interactive menus. * Splash PRO EX limited time offer is valid until major functionality of "advanced view" is available. Splash PRO lets you enjoy your videos like never before - smooth motion, crisp details and vivid colors. Enjoy the best video quality and unique user experience. Play all your High Definition AVCHD, MPEG-2, AVC/H.264 and VC-1 movies and camcorder clips, incredibly fast, smooth and without problems. You don't need any additional codecs. Download, install, watch. It takes about one second to start application and High Definition video playback! Advanced picture post-processing engine, delivering stunning video quality. Watch standard and high definition videos like never before, enjoy smooth motion, crisp details and vivid colors. Download free trial of Splash PRO now and use Demo Mode to see the difference! Supports AVCHD format. Rediscover High Definition quality with Splash PRO and state-of-the-art Picture² technology! Watch your 20/24/25/30p clips smooth like never before with Motion² technology. Browse your clips directly from the AVCHD camcorder with HD Camcorder interactive menus.